LIMA — If you want to live to be over 100, increase your odds and move to Ottoville. According to data recently released by the National Center for Health Statistics, populations living less than a mile apart can differ greatly in average life expectancy. As the highest life expectancy census tract in the three county region of Putnam, Allen and Auglaize counties, the average Ottovillian lives to be 84.8-years-old. 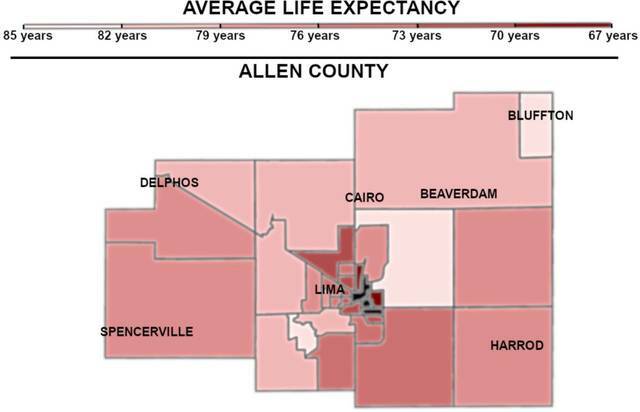 The lowest life expectancy census tract, coming in at 69.1 years, goes to the neighborhoods surrounding Lima Memorial Health System on the east side of Lima. Allen County Health Commissioner Kathy Luhn said the new life expectancy data allows county health departments to better identify the specific variables that influence the general health of particular towns and neighborhoods. Collected through a partnership with the Robert Wood Johnson Foundation, the National Association for Public Health Statistics and Information Systems and the National Center for Health Statistics, the data consists of tracking residential addresses of those who died between 2010 and 2015. Information regarding certain census tracts, however, were withheld from the final report due to a lack of information. Overlaying the data onto county census maps does reveal a few general trends concerning public health. For the most part, life expectancy is higher for those who live in rural areas compared to urban areas. A stark example is the difference between the census tracts that make up Bath Township and east Lima, where average life expectancy can differ by more than a decade despite the two tracts abutting. Luhn said there’s no single factor that can point to how long someone might live, and the reason between the variances of life expectancy are due to a number of complicated variables, such as health care, personal behaviors, environment and socioeconomic factors. When the data is considered in aggregation, however, it can serve as a type of road map for future street-level health initiatives. Allen County Public Health does have a number of county-wide health initiatives outlined in its community health improvement plan, but localized data helps the agency work more closely with community and neighborhood leaders down at the ground level to identify the factors holding down life expectancy in a particular area. Average life expectancy in Allen County is 77.95 years, which is slightly over Ohio’s state average and under the national average. As for life expectancy averages in Putnam and Auglaize counties, both counties rank higher. In fact, Putnam consistently places in the top ten among Ohio counties in the Robert Wood Johnson Foundation’s annual public health rankings. Putnam County’s average life expectancy is 80.03. 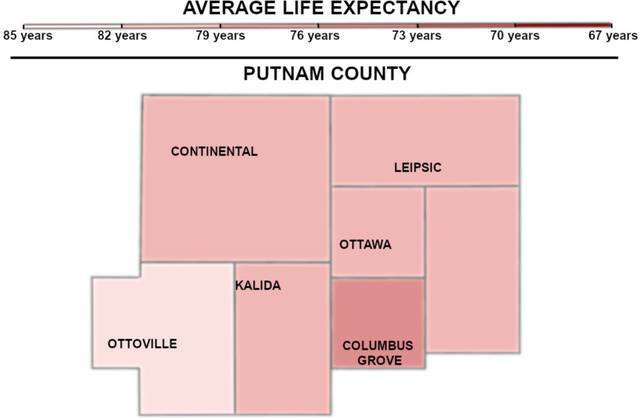 The lowest life expectancy in Putnam is 78.8 years, which is belongs to the census tract that includes Columbus Grove. Putnam County Health Commissioner Kim Rieman said the county often ranks high in social support, and that idea of community correlates strongly with higher life expectancy. “They correlate very well with each other. If they have that support and those positive social characteristics, it helps them with access to care and the care that they receive results in a longer life,” Rieman said. As for public health initiatives for the county, Rieman named reducing obesity and alcohol abuse while improving mental health. 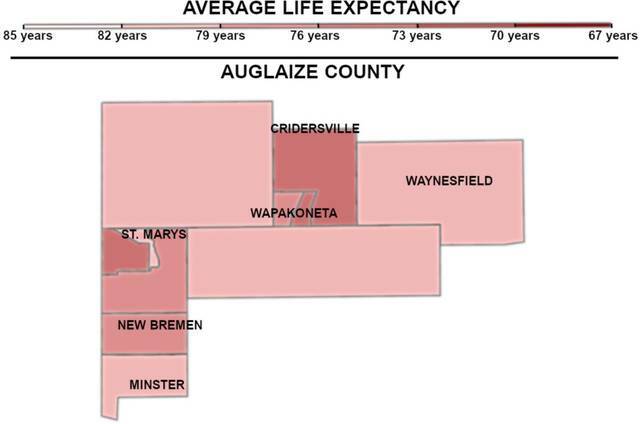 As for Auglaize County, the life expectancy average stands at 79.16 years, with the lowest life expectancy average of 75.5 years belonging to the Cridersville census tract. Other census tracts with similar poverty levels, such as the Grand Lake St. Marys and west Wapakoneta census tracts, had life expectancy averages not too far behind.